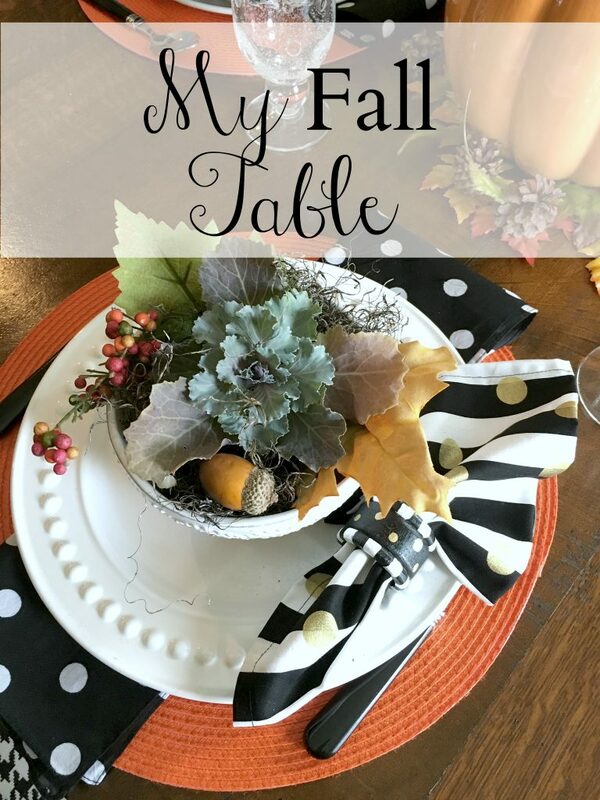 It’s time to decorate the kitchen table for fall. 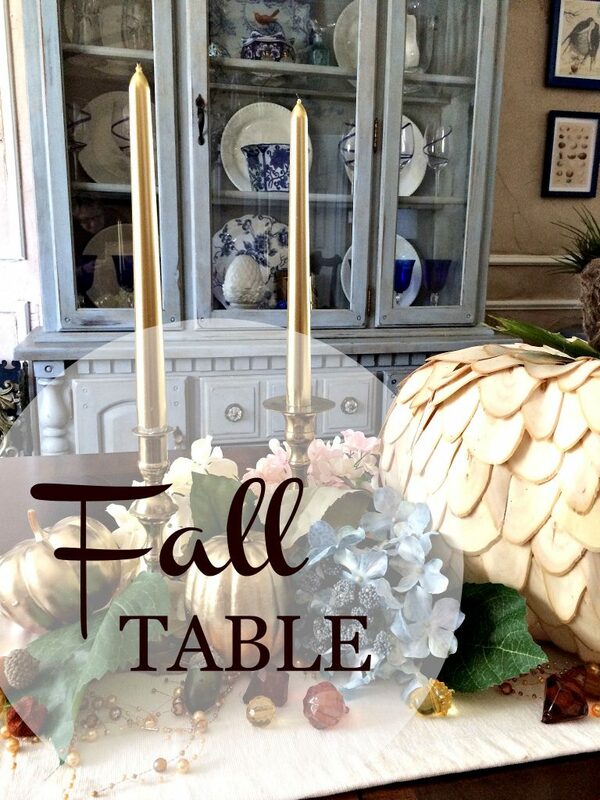 I’ve been putting it off because I had such a hard time with the formal dining room. Or maybe I am just waiting till it’s time to decorate for Halloween. It couldn’t possibly be because I am lazy. Right? I know..such a third world problem! I think that I am on overload with “stuff”. I am ready to simplify, but let’s face it that word isn’t usually in my vocabulary. I wanted something different from what I have used in the past, I just couldn’t find it. So I decided to make the things I couldn’t find that I wanted to change. 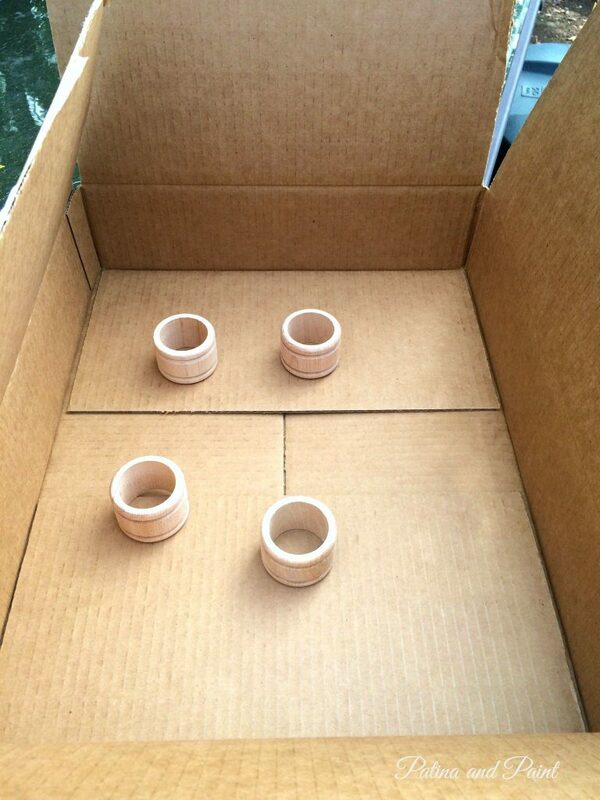 One of those things was the napkin rings. 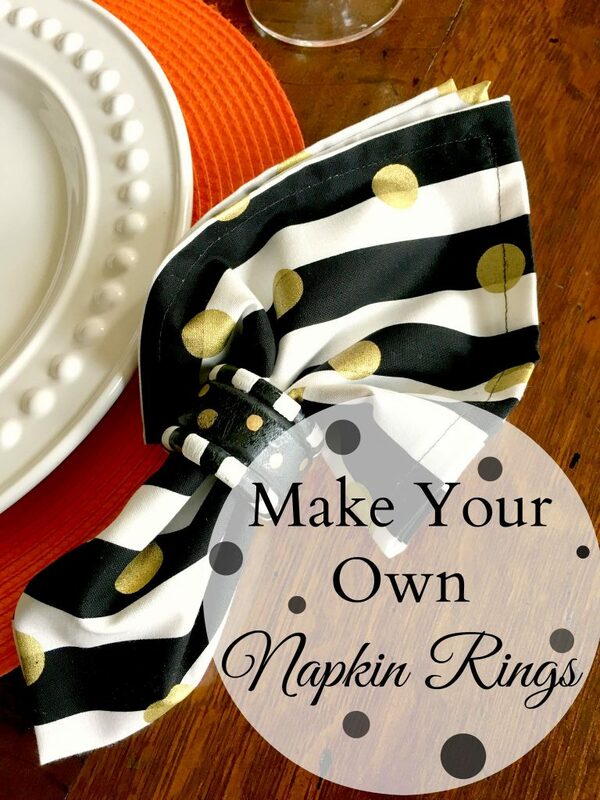 Once I show you how easy it is, I know you are gonna want to make your own napkin rings too! 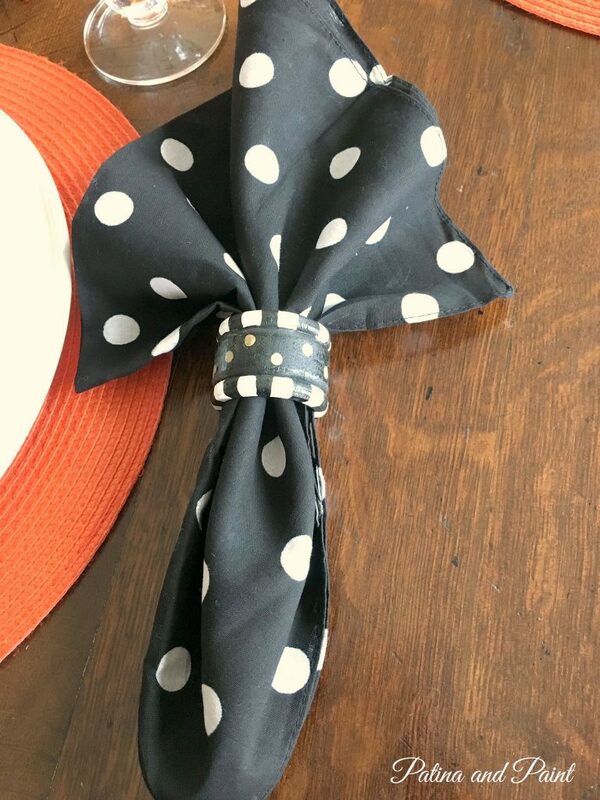 Since my kitchen is black and off white with hints of turquoise thrown in I went looking for napkin rings in those colors that I could use all of the time. 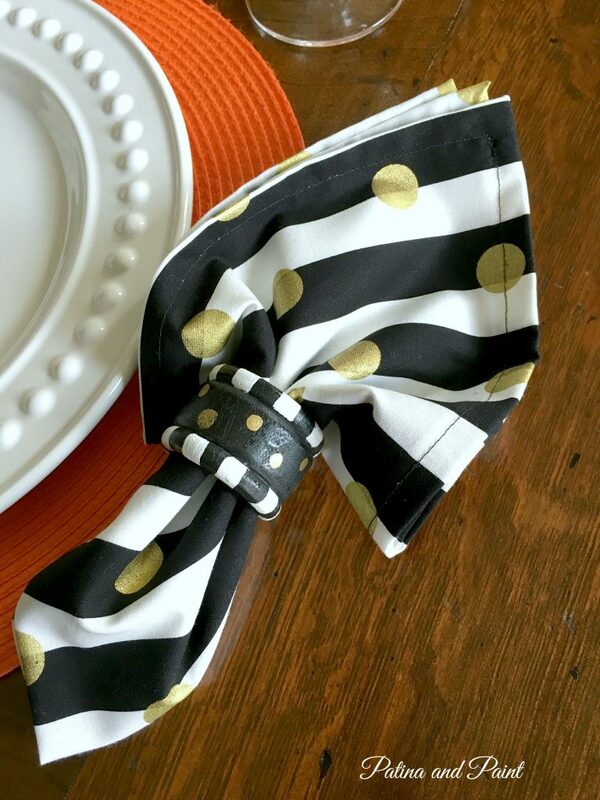 I found some awesome MacKenzie Childs black tie napkin rings that I totally loved. 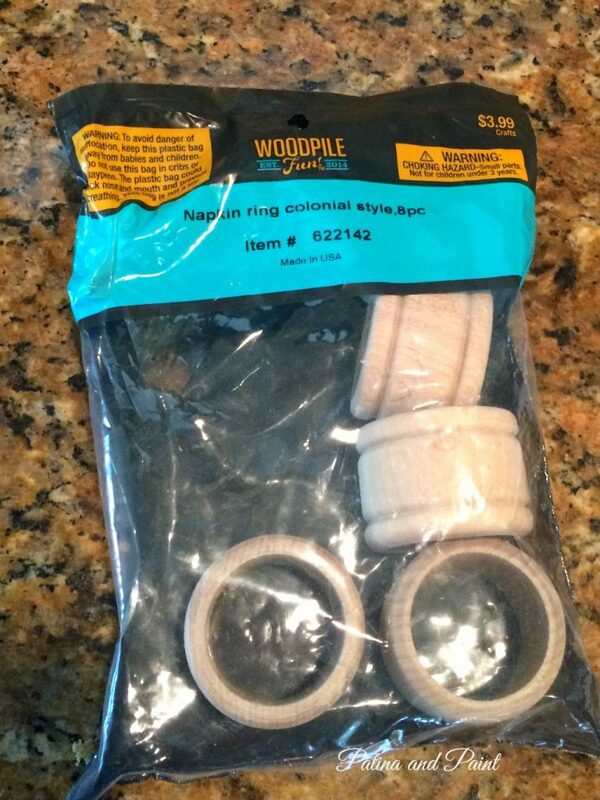 However, at$18.00 a piece they were way out of my napkin ring budget. Then I saw these unfinished ones at Hob Lob for $3.99, less my 40% off coupon. They were very similar in style. In fact, they were almost perfect. Like my paint booth? Yep, I am a classy girl! 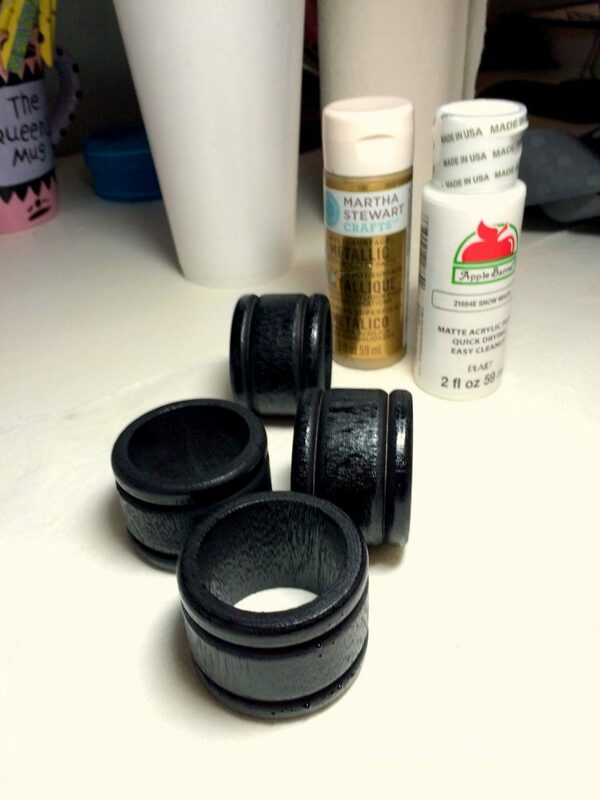 I spray painted the rings black. Once black, I got out the white and gold craft paint. I started on the outside edges and painted some white stripes. As you can see, they aren’t perfect, but that’s okay. I don’t really mind that they aren’t perfect, I wanted them to look hand painted, not machine made. 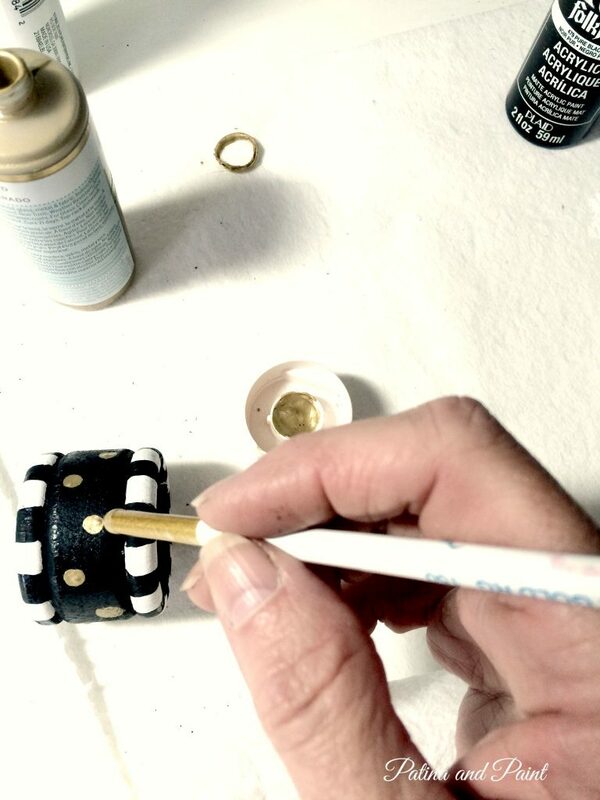 Using the end of a paintbrush, I dipped the end into the gold paint and made gold dots in the middle of the napkin ring. 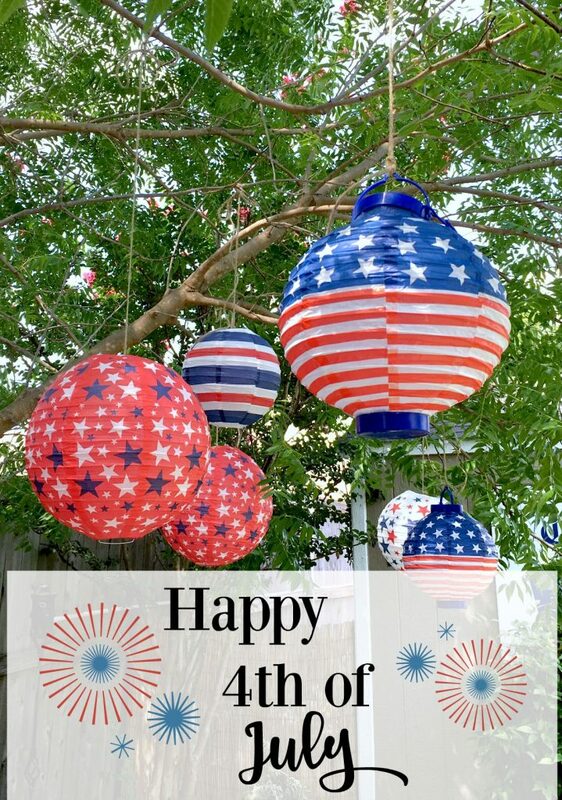 I love Martha Stewart’s gold metallic. 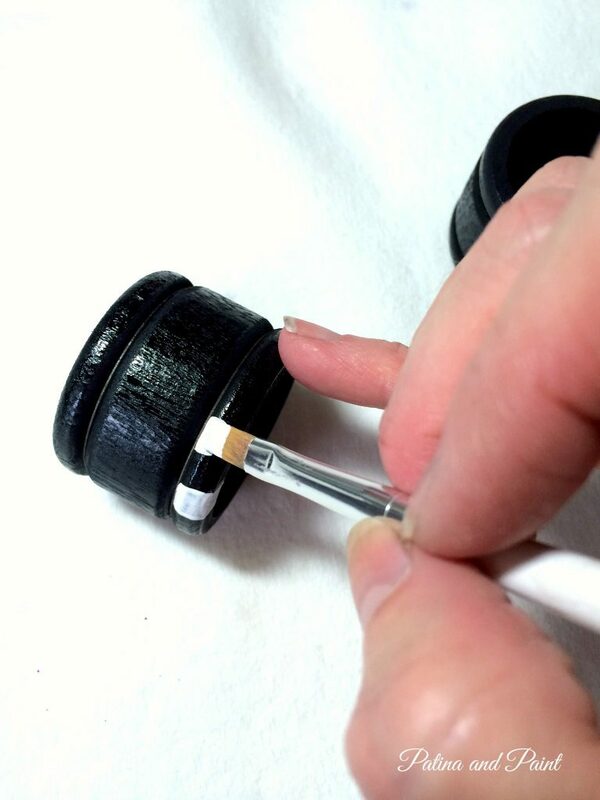 It is the perfect gold color and usually you only need one coat of paint. 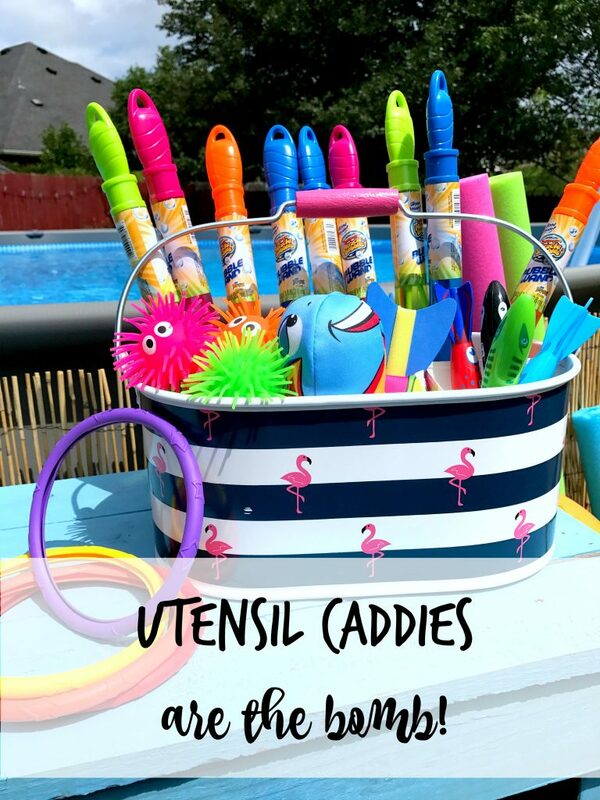 For a metallic paint that is almost unheard of! Here’s the napkin ring with my old standby. Black with white polka dots. It’s really a $1.00 bandana from WalMart, but I swear the size is perfect and the more you wash it the softer it gets. 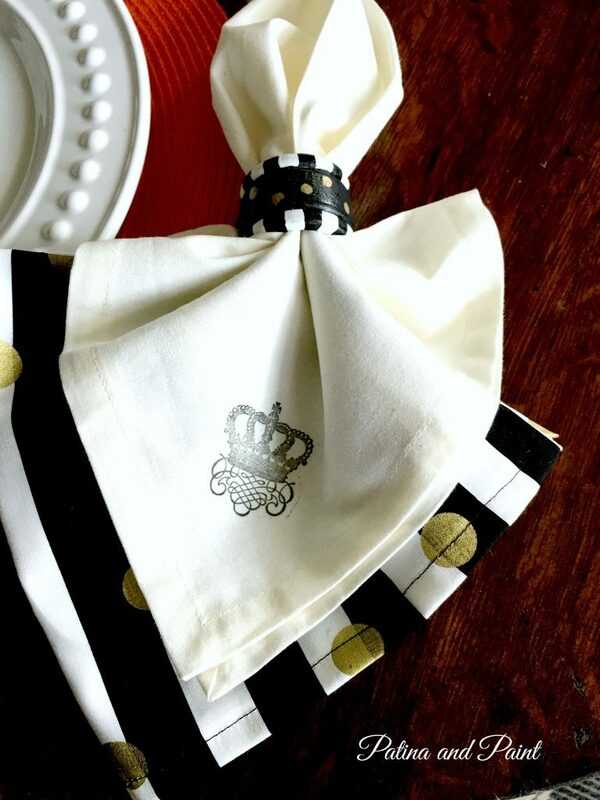 I think the napkin rings even look great with the crown napkins I made here. 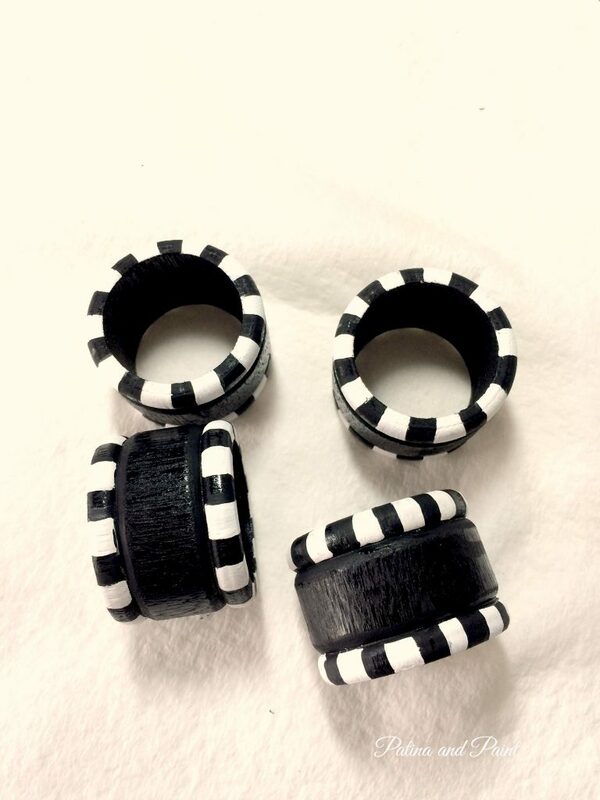 These napkin rings were super easy and really cheap. Each napkin ring cost me less than 50 cents each. Paint included. You just can’t beat that. Is it as perfect as MacKenzie Childs? No, but I am pretty happy with the results. 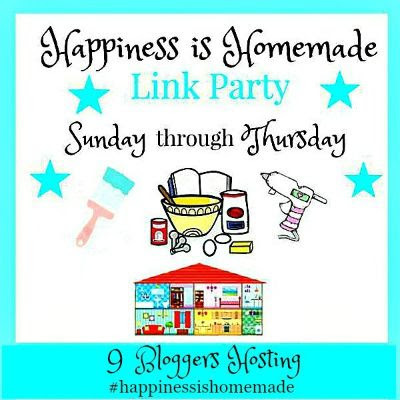 You can find me at these wonderful blog parties…. These are adorable. I love your creativity! 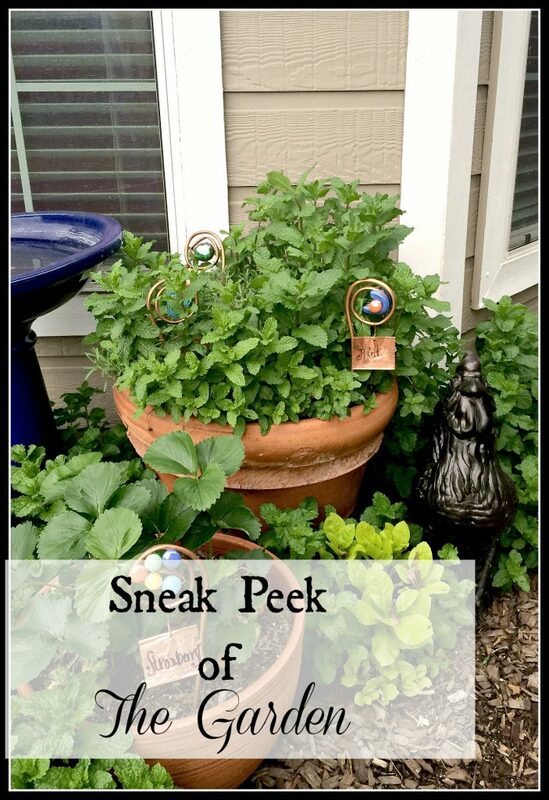 I hope you will stop by and share these at the Thursday Favorite Things Blog Hop this week. We go live at 8 pm CST on Wednesday Evening! 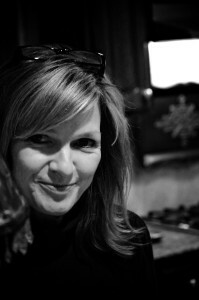 Thanks so much Debi! I will.